While hunting through a mountain of necklaces to pop color into my daily black attire, I started thinking of the commonalities and complexities that exist within ethnic ritual jewelry. The meaning of color combinations, bones, sinew, beads, glass, amber and hand-hammered metals. The creativity of the findings that lock the artistry in place, the knotted strings and waxed threads. I recall sewing bells into the hems of my skirts that created a faint sensual sound as I left the room. A vial of patchouli oil that hung from my waist beads exploded with scent from my body’s warmth. Lockets with tear-stained secret prayers folded and tucked between hammered copper disc bound with worn leather shoe laces. Oh, I was a praying, consulting Sista! Rituals created with beads soaked in various oils and passed along with the sweetness of protection. Healing stones taped in my navel to protect and clean my chakras. Those were the days of my youth, wrapping cobalt blue beads around the necks of deities as offerings to my ancestors. An exclusive invitation to consult and be cradled in the arms of Oshun and Yemaja. Oshun in the Yoruba religion, is a spirit or deity that reflects one of the manifestations of God. 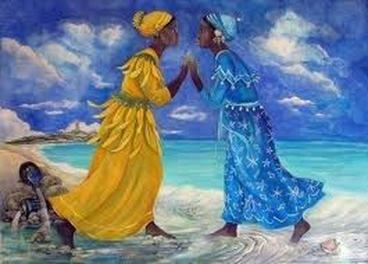 Oshun reigns over love, intimacy, beauty, wealth and diplomacy. Yemaja, also a deity in the Yoruba religion, is the ocean, the essence of motherhood, and a fierce protector of children. In my oddity, I began to think of culture, style and fashion and how it’s interpreted in our lives. Our expressions with talismans and rosaries? A silent interchange, a glance, a stare, a nod of appreciation? I’ve stood in front of a mirror and changed my necklaces several times, asking myself, how will I be perceived throughout the day? Is it too much, too strong, does it have a flow? What message am I sending with its bold, esoteric value? It’s time to pass along messages to our youth about the importance of connections, social issues, and value of human life. The slightest gesture can last a lifetime and help to redefine the life they’re experiencing. What ritual can you create today, enhancing and empowering within fashion, style and cause? While researching, I discovered a company creating “Fashion For a Cause,” International Sanctuary, a social entrepreneurship that sells handcrafted jewelry under the label iSanctuary. Each label carries the artisan’s name, names that aren’t known to the fashion industry. They are survivors of human trafficking. Let’s use our spending and fashion power to change the world. Reach back, above and below and pull someone closer. Visit: http://www.iSanctuary.org. In 1978, I can recall that a cleaning woman named Narcissis in her 70s worked in the shadows of our office where she and I were the only brown women. She was the past and I was the future, and we coexisted. Often glancing at one another and nodding, rarely stopping for conversation — after all, I was part of the sales force, and I was moving on up! One snowy day she approached me as she was emptying my wastebasket and shoved a paper towel in my hand and softly tapped. With my furled brow, I quickly put it in my purse and walked briskly to the restroom. Unfolding the neatly presented gift, I discovered a gold, emerald-encrusted bracelet. It took my breath away. I was stunned by its beauty and why she made the decision to pass such a heirloom to virtually an unknown stranger. I rewrapped the gift and returned to my desk with a rapidly beating heart. Though I awaited my opportunity to say thank you, Narcissis never returned to work. I later learned she had passed away; and to this day, I still have the paper-towel-gift-wrapped bracelet. Occasionally, I come across it in my treasures and think what it took for Narcissis to pass me that gift and the meaning associated. I never knew; I can only think that it was one of love and appreciation between two brown women, one with a life long lived and one with a life filled with promise. Àse is a Yoruba concept that signifies the power to make things happen and change. It is given by Olodumare (the Creator) to everything — Gods, ancestors, spirits, humans, animals, plants, rocks, rivers, and voiced words such as songs, prayers, praises, curses, or even everyday conversation. So I dedicate this article to Narcissis who worked in the shadows of our office and watched and protected me with her silent prayers. Takara Beathea-Gudell is owner/operator of Takara, a women’s clothing store in Oak Park. This first appeared at gardenspices.org, an online magazine.